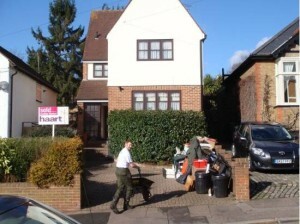 D o you want a house clearance company who will take your every requirement on board? With Away With It, your house clearance package in East Ham will be completely bespoke to your needs. If you want a friendly team, affordable price and unrivalled customer care, get in touch with Away With It today. 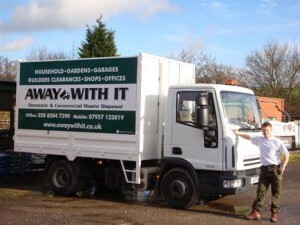 We are a fully licensed and insured waste removal company with a green approach; recycling 80% of what we remove. Our expert teams are here to take the stress out of the items you need removed and we can provide same-day quotes and collections in East Ham if it suits you. Whether you are moving, need to spring clean or have the builders in, having a room or house full of clutter can be very stressful. We also know that moving some large items can result in injury, so we’d much rather do the hard shifting for you! No job is too big or too small for the Away With It team. We can move a single item or clear an entire property. Whether you want the three-piece suite gone or want to gut the garage, just give us a call. Part of what sees our customers returning and recommending us to their friends is our ability to provide a service when it suits you. Customers tell us exactly when they need us and we make it happen. We offer quotes and services seven days a week, from 7am to 11:30pm. As a result, no matter what your plans, we can tailor our service to suit your needs. To ensure you are never waiting around, we will always provide you with a two-hour guaranteed time slot. Your dedicated house clearance team will always give you a courtesy call when they are on their way to your property, just to keep you in the loop and to let you know they will arrive soon. Whether you’re in the midst of a house move or cannot get any time off work, we can clear your house whenever is best for you. Whilst our affordability and flexibility is championed, it is our 100% customer satisfaction that helps make Away With It the number one choice. We have been providing house clearance services throughout East Ham and the surrounding areas for over 15 years and our team has always been praised for the impeccable services they have supplied to our valued customers. You can rest assured that you will always pay the best possible price with Away With It. We charge by the volume of waste removed, rather than ‘load’. This means you will only ever be paying for the exact space you use, meaning house clearance from us is much more cost-effective. Call us now get your home cleared. The sooner you call, the sooner we can sort out whatever needs clearing from your property. Whatever the job, do not hesitate to give us a call. We will arrange a time most appropriate with you to give a no obligation quote and, if you’re perfectly happy, we can then organise a date and time best for you to clear your house. If you want to discuss your needs for house clearance in East Ham or would like to receive a quote from our team, give us a ring on 0208 504 7390. We are happy and available to take your call 7 days a week, from 7am to 11.30pm.